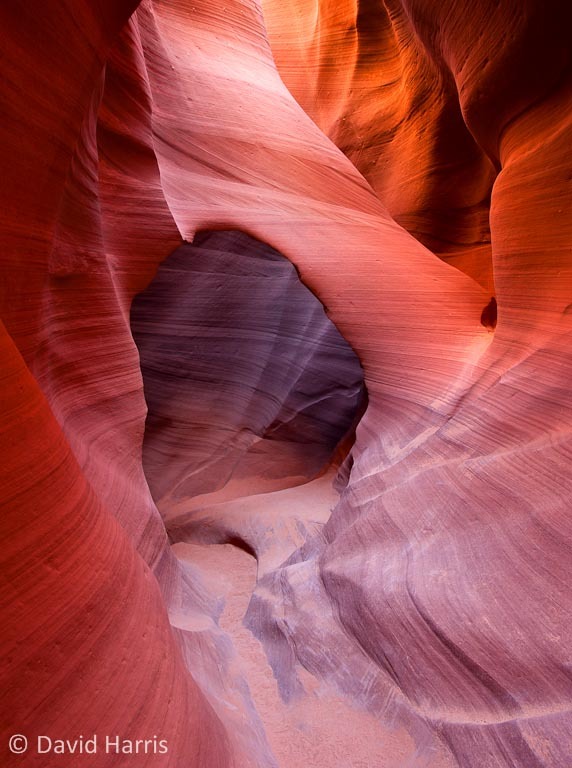 Lower Antelope is a photographic gem. 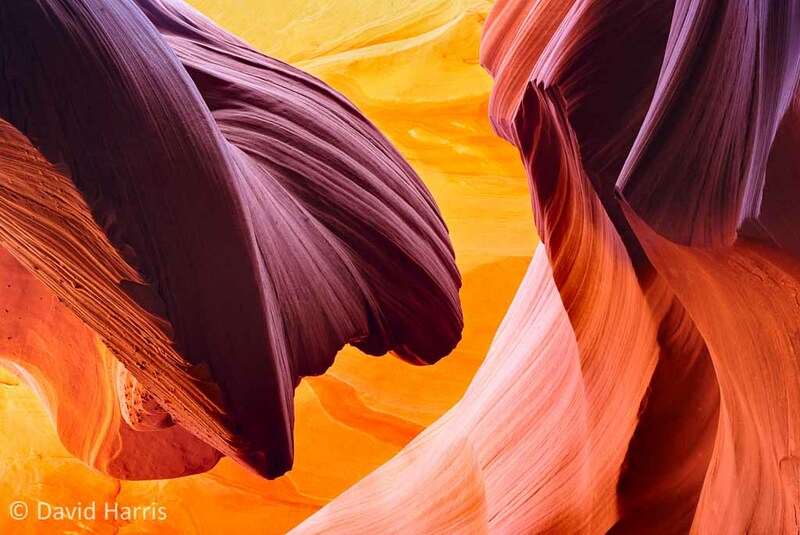 Its sinuous curves and majestic colours make it unique amongst the Colorado plateau’s many slot canyons, add to that its relative ease of access and it is an must see if you are in the Page, AZ area. 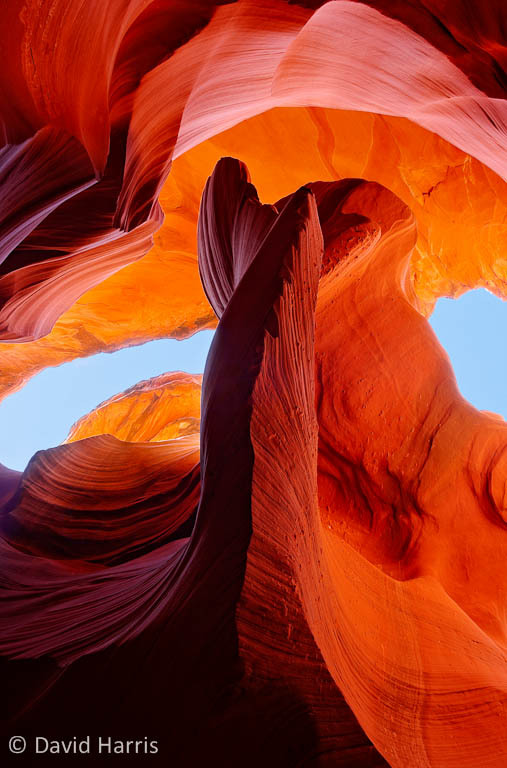 The canyon is a place of immense beauty and atmosphere, yet its magical twists and curves are a testament to the massive forces that created them: flash floods that can, and have, had tragic consequences. The Navajo who own and run the canyon have emergency facilities to aid people to escape if the worst happens, but these should not be called upon as the canyon is closed when rain is forecast anywhere in the drainage area. 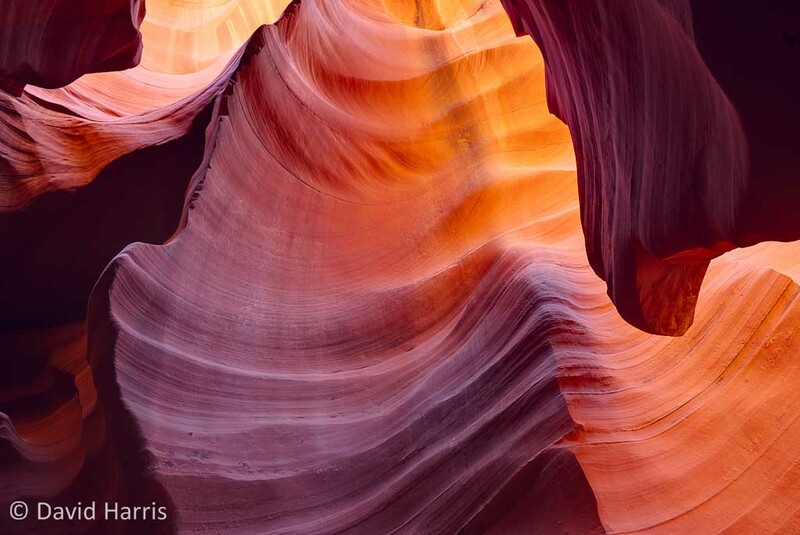 At times the canyon can be quite busy with tourists, but we found that most people are with guides who are very polite and understanding towards photographers. So mostly photography was relatively easy, apart from in the narrow lower part of the canyon. We spent two mornings here in September. The first day we concentrated on the top half of Lower Antelope. The colours are extraordinary, yet pose a challenge when rendering the RAW files. I generally chose a colour temperature around 5500K; this seemed to give the split between yellows, oranges and purples that I saw when I was there. 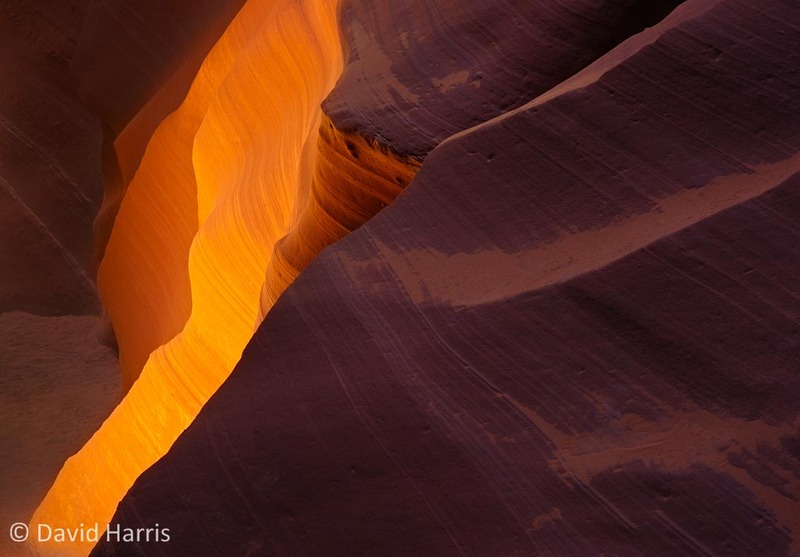 The above image was taken as some beams of light hit the base of the canyon. Rather than photographing the beams (an exercise guaranteed to coat your camera gear with dust) I concentrated on the reflected light that made the walls glow orange, contrasting this with cooler unlit areas. The general advice is to avoid including the sky and any directly lit areas in your photographs. Whilst good advice, all rules are made for breaking! The above image shows an HDR rendered scene looking straight up. The second morning we concentrated on the lower half of Lower Antelope, starting at a huge arch. The arch is interesting as it clealy shows the route of the water flow to the right of the arch before it cut a lower, straighter route through the arch. The lower part of the canyon is quite deep; the steps out are quite strenuous on a hot day. Despite this, the contrast between warm and cool colours is just as good as further up as seen in the shot above and the one below. 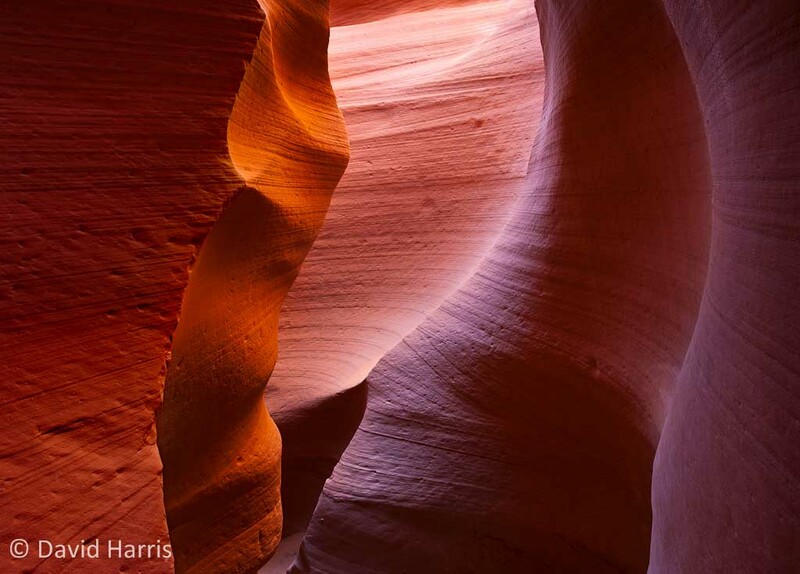 More images of Lower Antelope Canyon can be seen in our gallery.